Sleek, polished, and sophisticated, mega yacht SIERRA ROMEO was designed to impress. An exceptional beauty suited for those with impeccable tastes she features clean modern lines, chic exterior lounge spaces, and elegant interiors. Exquisite accommodations are provided for 12 passengers in 6 beautifully appointed staterooms. 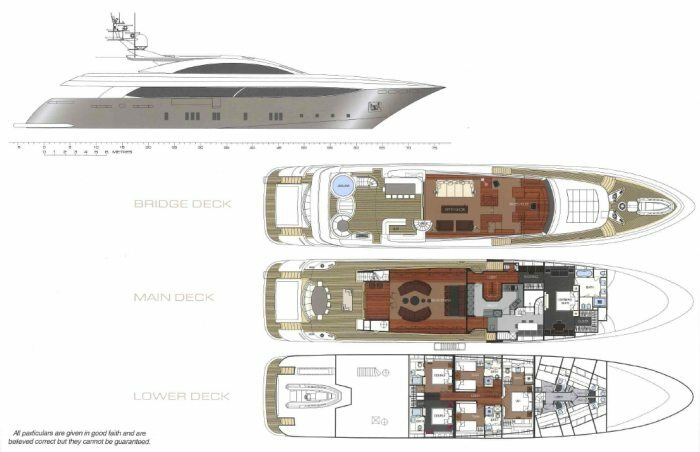 The extremely spacious full-beam master on the main deck is divine offering a generously sized wardrobe, lovely settee area, and luxurious ensuite bath. Located on the lower deck are a stunning full-beam VIP suite, 2 twin cabins, and 2 double cabins. Stylish beyond compare, charter yacht SIERRA ROMEO boasts of a sumptuous and refined interior complete with high-end finishes and designer touches that prevail at every corner. Tasteful décor and a dramatic color scheme of warm honey, rich chocolate and soft taupe exude glamour. Ideal for entertaining, the salon and sky lounge offer plenty of space for hosting an intimate soirée. For those that love the feel of a cool ocean breeze and soaking up some sun, the ample deck areas on mega yacht SIERRRA ROMEO offer a world of enjoyment. Sunbathing on the sun deck is blissful, while the bridge deck and aft deck serve as delightful areas for spending an enchanting evening under the stars with friends or family. Watersport enthusiasts will be impressed with the wide assortment of toys onboard SIERRA ROMEO including 2 Seadoo waverunners, 2 Seabobs, adult and child water skis, tubes, a kneeboard, a wakeboard, a windsurfer, a banana, fishing and snorkel gear. Luxury charter yacht SIERRA ROMEO has an outstanding crew of 8 that is proficient at providing charter clients with exceedingly superb service and ensuring the most magnificent time onboard. For an exquisite holiday in paradise, SIERRA ROMEO delivers pure perfection. All cabins have ensuite facilities.